April is Valley Bike Month and this year, it’s been kicked into high gear. Valley Metro sponsors the month-long commitment to ride your bike to improve your health, save money and reduce congestion and pollution. 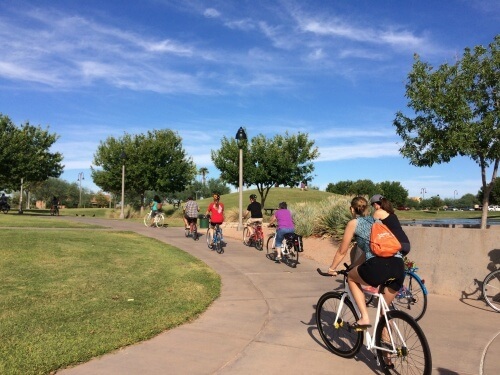 With events all over the Valley, there’s plenty to keep you out and moving. Here are the events you’ll find in the central Phoenix area throughout April. Image by Dave Biersack. Courtesy of Valley Metro. 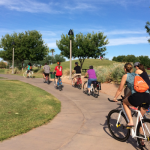 April 7, 14, 21, 28| Phoenix Spokes People Ride & Grind Meet Up | 7 a.m. This Friday morning tradition is less about the commute and more about the community. Friends old, new, and yet-to-meet gather at various central Phoenix coffee houses at 7 a.m. for a sip and a visit before work. Newbies are welcome to post on the page and ask for route suggestions or a ride buddy. Free, open to the public. 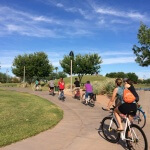 April 8 | Phoenix Spokes People and Bicycle Nomad Café Pedal Public Art | 9 a.m.
For more than a year, Phoenix Spokes People has partnered with Bicycle Nomad Café to produce interesting rides the second Saturday morning of the month. This time we’ll visit and learn about public art and its inspirations and effects on the central Phoenix community. Ride may be 12 miles or more in length, but the pace is leisurely and the group is supportive. Free, open to the public. 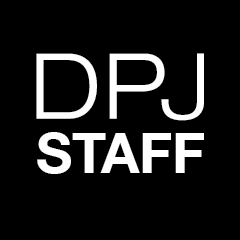 April 10 | PHX Downtempo Ride Bike-In Movie | 7 p.m. The Downtempo is a gritty, groovy group that’s been riding on Monday nights for a couple of years in DTPHX. Meet up at 7 p.m. for a friendly bike ride, or just join the group at Filmbar for the 8 p.m. showing of Breaking Away. 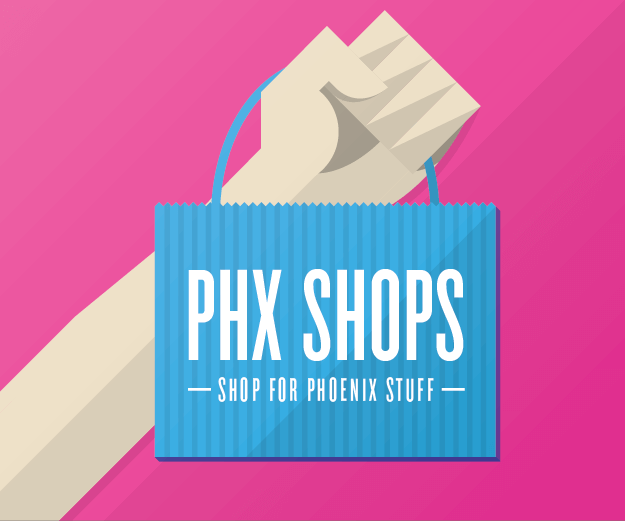 A portion of ticket sales will benefit Phoenix Spokes People’s bicycle advocacy efforts. April 15 | Phoenix Spokes People Bike Prom | 7-11 p.m.
Was your first prom not-so-perfect? High school not your favorite time in general? Here’s your chance at a redo surrounded by bicycle-riding misfits and craft beer! 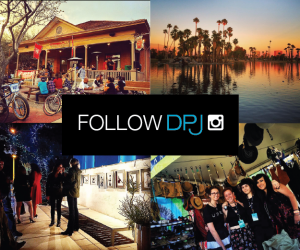 DJ, prizes, shenanigans. Private, ticketed event. Don’t miss the pre-prom ride from Civic Space Park to the Prom! 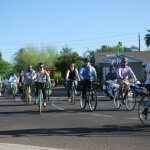 April 19 | Phoenix/Maricopa County Downtown Bike to Work Ride | 7 a.m.
Three words: Free. Breakfast. Burritos. Plus, prizes! Pre-register to ensure your spot. Murals are everywhere around downtown Phoenix, and they play an important role in the culture of the city. 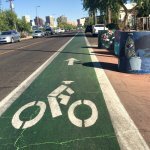 Hop on a bike and explore the obvious and not-so-obvious street art that dots our urban landscape. Fee, see website for details. 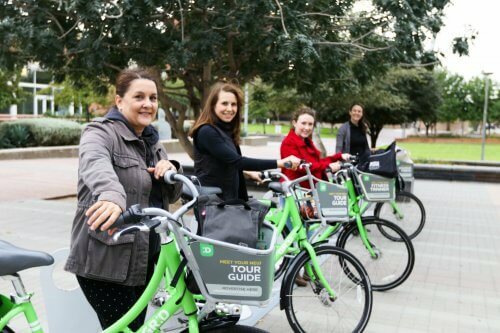 Even if you don’t own a bike, you can still get in on the fun! GRiD Bike Share has stops all over downtown Phoenix so grab one while you can!